Axminster, Honiton, Sidmouth, Seaton and Beer is an ideal location for a holidays in East Devon with access to the Jurassic Coast at Lyme Regis and Charmouth. This region of East Devon is known for its tranquil scenery, and landscapes of rolling hills, pasture and ancient woodland - with many parts being designated as Areas of Outstanding Natural Beauty. The historic (12th Century) pub, The Tuckers Arms is situated in the picturesque village of Dalwood. A perfect place for walkers and cyclists with many footpaths and quiet lanes for cycling. 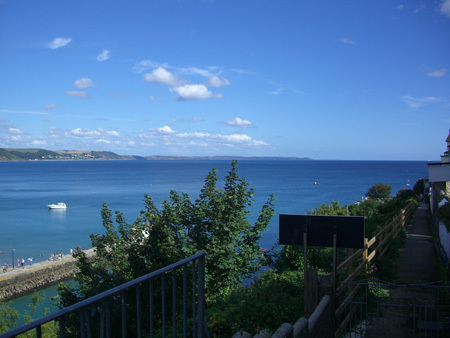 Also we are close to the coastline, where Beer, Branscombe, Sidmouth, Lyme Regis are situated. There are also larger towns to visit: Honiton, Axminster, Exeter, and Taunton, all a short distance away. Axminster and the East Devon Coast has a dramatic coastline where the rolling hills meet the sea - with stunning views over an unspoilt rural valleys - an area where little has changed over the centuries. Here youll feel protected from the busy outside world and be able to enjoy the self catering cottages and bed and breakfast in this Area of Outstanding Natural Beauty. Holiday Cottages and Self-catering holiday Apartments and Caravan breaks in the Sidmouth, Seaton and Beer , Lyme Regis and Charmouth area provide the perfect location from which to enjoy and explore the sights and sounds that Devon has to offer. Devon Online Offer a variety of self catering accommodation (Caravans, Holiday Cottages, Campsites and Holiday Apartments) close to Axminster, Beer and Seaton. In this picturesque part of East Devon, Holiday cottages and barn conversions are very popular choices for holiday stays, offering a subtle blend of period charm and original features with modern comforts. Families with children and active youngsters often choose to stay at one of our listed holiday parks or Caravan sites, as they often have a range of activities, swimming pools, play areas etc. included on site. The page was originally the webpage for Hawley Farm Cider Press and Wagon House - offering Self-catering Holiday Cottages in the Axminster area of East Devonn. the advert ran from 30th November 2010 until it was replaced in January 2014, with new content offering alternate holiday in the area. Self-catering Holiday Caravan accommodation in Seaton. At Axevale Caravan Park in Seaton Pets are Welcome - Dog friendly establishment. At Hedge End Hideaways in Colyton Pets are Welcome - Dog friendly establishment.